Several times per year parents and godparents prepare for their children to receive the Sacrament of Baptism. To become part of our St. Francis Parish family, or to update your current registration information, please register. Please contact the Baptism Team at (916) 443-8084 x110 or InfantBaptism@stfrancisparish.com. Your child is a gift, a gift from God. How wonderful for you and your family to recognize and wish to celebrate God's gift of love with the sacrament of baptism. Our parish community looks forward to being a part of this celebration with you. Children may participate in the Children's Rite of Baptism generally through seven years of age. After that we encourage them to participate in the CIC (Christian Initiation for Children). More information regarding CIC can be found on the Children's Faith Formation page on our website. Spaces fill up quickly, so the next available date may be several months from your time of registration. 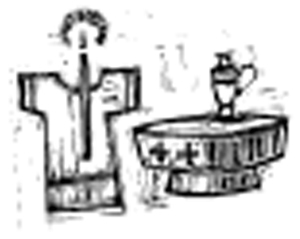 Complete and submit the online Official Request for Sacrament of Baptism form. After submitting the form, contact the Baptism Team at infantbaptism@stfrancisparish.com or (916) 443-8084 x110 to schedule a family interview appointment. The Parish will need an original County (not hospital) certified birth certificate or adoption/guardianship papers. A photocopy is not sufficient. Please bring this with you to the Family Interview appointment. We will make a copy and return the original. Come in for family interview - interviews are scheduled on the second Sunday of each month from noon to 3:00 p.m. with appointments every 20 minutes. If you have an appointment, please come to the gate located along 26th Street and ring the bell for entrance. Please note: Baptisms are not scheduled until after the Family Interview. Following the Family Interview, a confirmation letter with dates of baptism, preparation class, and baptism rehearsal will be mailed to you. Parents and godparents are expected to attend the required Preparation Class and rehearsal. Celebrate the Sacrament of Baptism. Baptismal families must arrive at the church 30 minutes prior to the beginning of the Rite. We highly recommend that other family members and friends arrive early as well since we are not able to reserve pews for them. Unfortunately, videography of this Sacrament is not authorized. Furthermore, in order to preserve the sacred character and integrity of the celebration, we ask that families do not use flash photography and remain in their seats during the Rite.